I love Coach bags, period. I eat, sleep and breathe them. They are my kryptonite. I have a hard time resisting anything Coach! I have been selling Coach items on Ebay and have been doing so for over 10 years. Like I said, I am a Coachaholic! The quality of these bags are irresistible. They are fashionable, a little sassy, and at times just down right classy! And often times the best deals on authentic Coach bags are found on Ebay. Yet not all these "authentic" bags are real. So how can you tell a real authentic Coach purse from a fake? 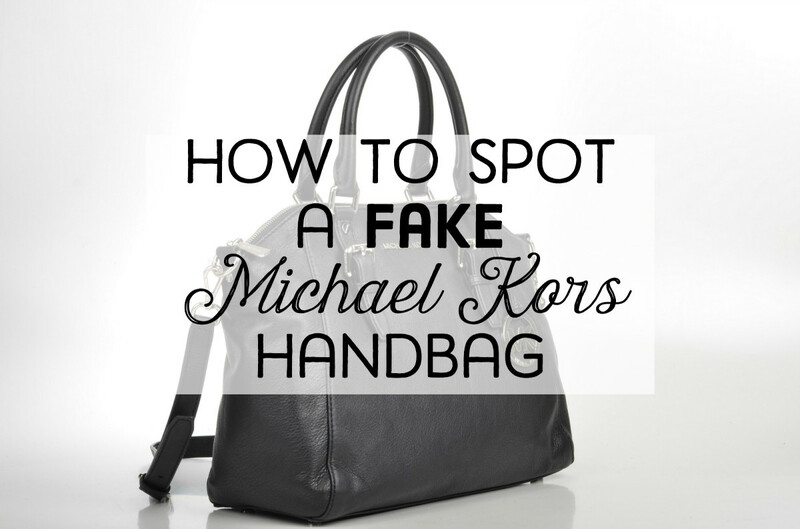 Below I discuss five foolproof ways to determine whether a Coach purse is real. The first way to tell if a Coach bag is real is to look for the Coach leather creed. 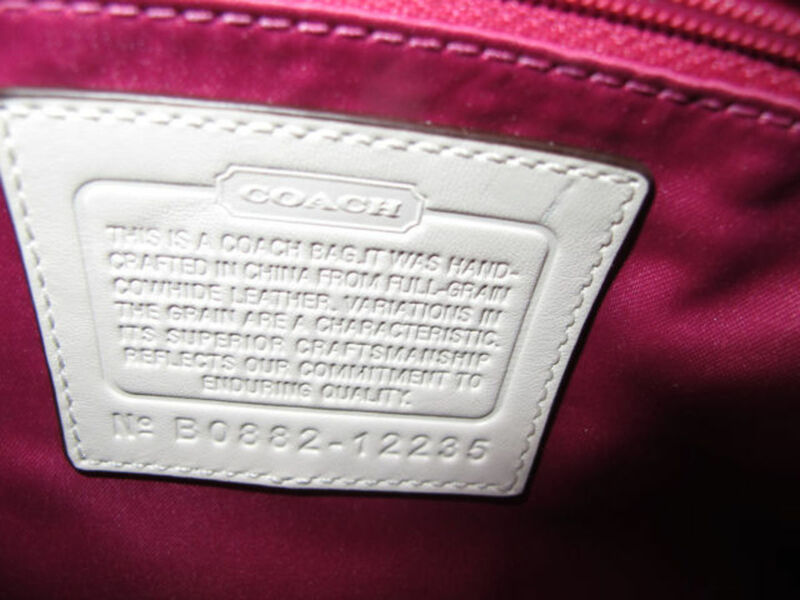 Every Coach bag has a serial number; it's as simple as that. 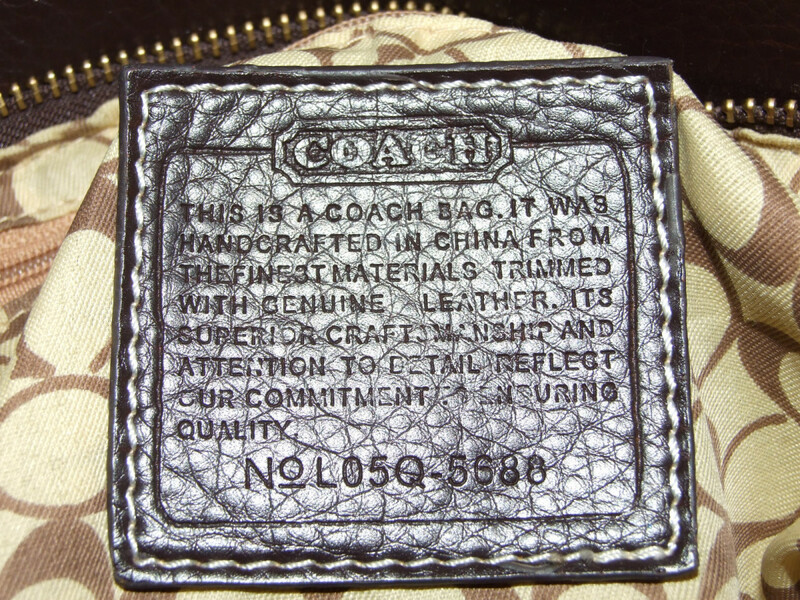 Inside most Coach purses is a leather patch, known as a Coach creed, which shows a serial number that corresponds to the name and type of Coach purse you are looking at. Large to medium-sized to large size Coach bags will always have a Coach leather patch with a serial number inside the bag. Some of the smaller bags (such as top-handle bags or clutches) don't have the patch, but they will still have a serial number, and they can be verified. The serial number will be listed on the sales tag. If the sales tag for a small bag is not included in the auction or sale because the bag is pre-owned, then please take this into consideration before bidding or buying. On a Coach creed, you should see a letter, then four numerals, then a dash, and then more numbers: five numbers for newer bags, three or four for older vintage bags (pre-1990). The last five numerals are the style of the purse. 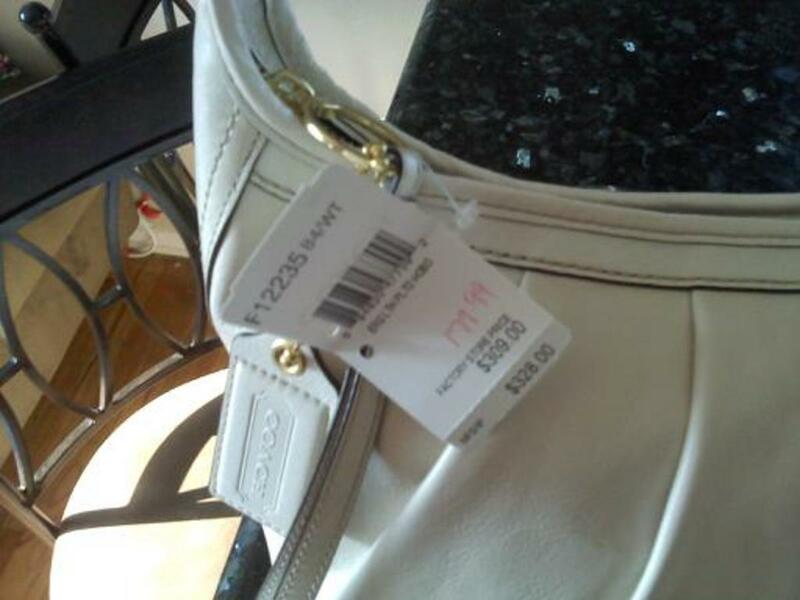 For example, a large white leather Coach Ergo bag has 12235 as its last five digits (see picture). You can take this number and type it into your search bar, either on Ebay or the Internet, with the word "Coach" in front of it, and search it. 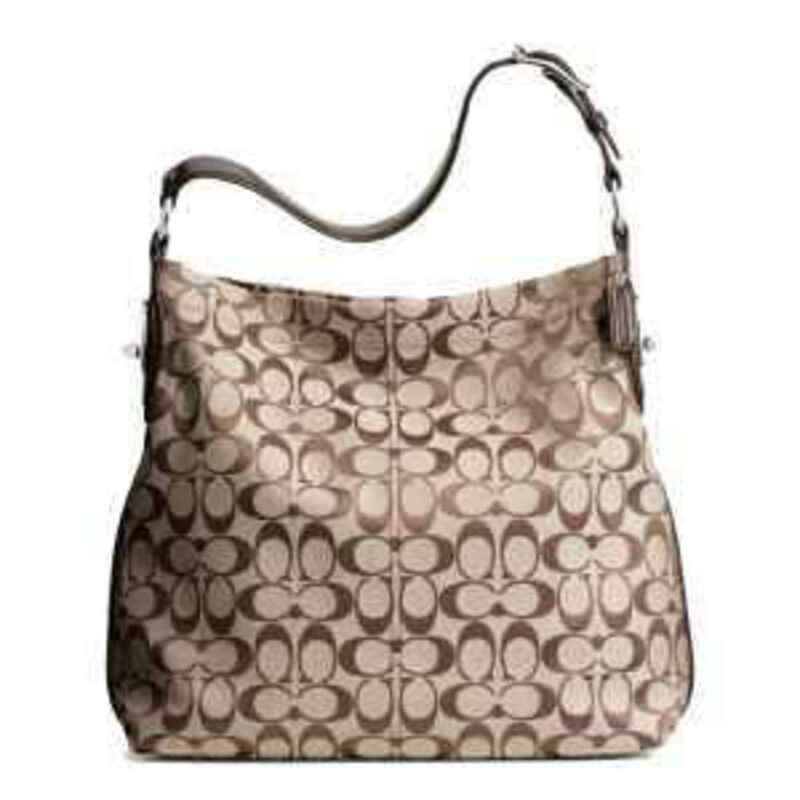 If your search results come back with similar pictures or descriptions of Coach purses then you know the bag is real. Also, this number can be verified by any Coach store (some will, some won't). So if in doubt, pick up the phone and call, it's worth a try! This number would be for a Coach Purse Style 5688. But style 5688 does not exist; a search will prove this. FAKE. The stitching on the creed is also messy, and the writing is not raised. Real metal and leather Coach hang tags. 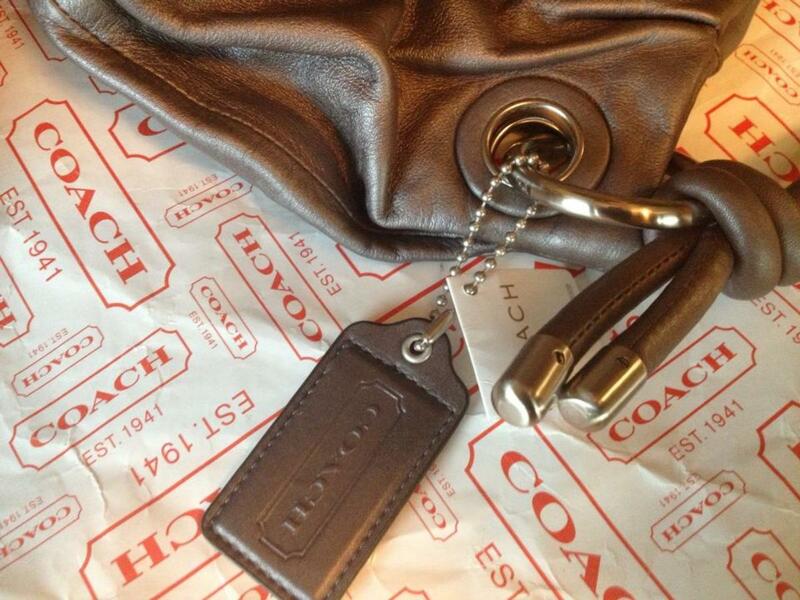 Coach hangtags are NOT sales tags, but small leather keyfobs adorning the outside of a Coach purse. They are ALWAYS leather and embossed with the word "Coach". 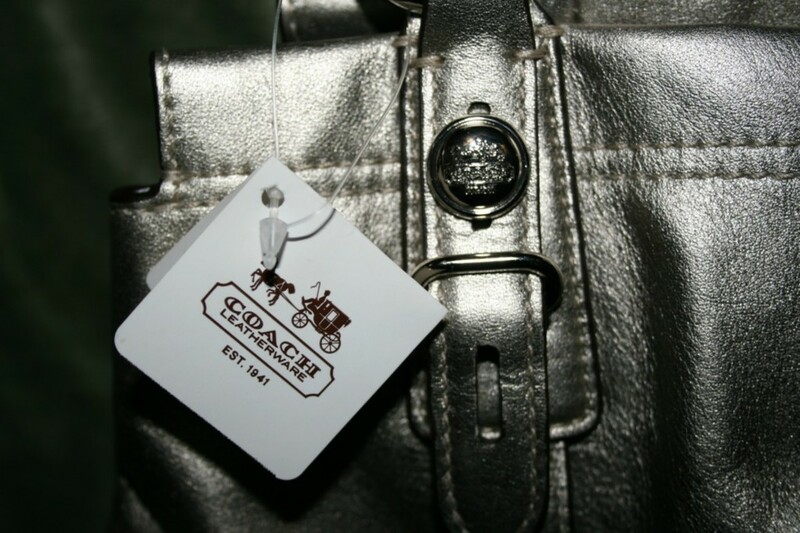 The only way a real authentic Coach purse would come with a metal hangtag is if it was a limited edition. 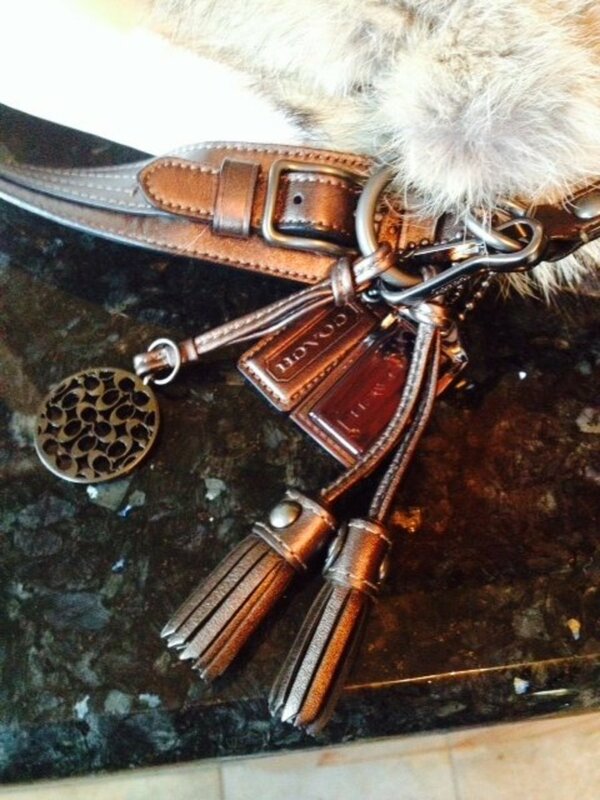 The metal hangtag would always be accompanied by one or two leather hangtags, or crystal studded. If you see a purse with a metal hangtag only (often gold-colored), it is fake, or at the very least its authenticity should be questioned! Update 2018: Some Coach hang tags are being made as Duos with both a leather and metal hang tag set, these will always be embossed with "Coach". 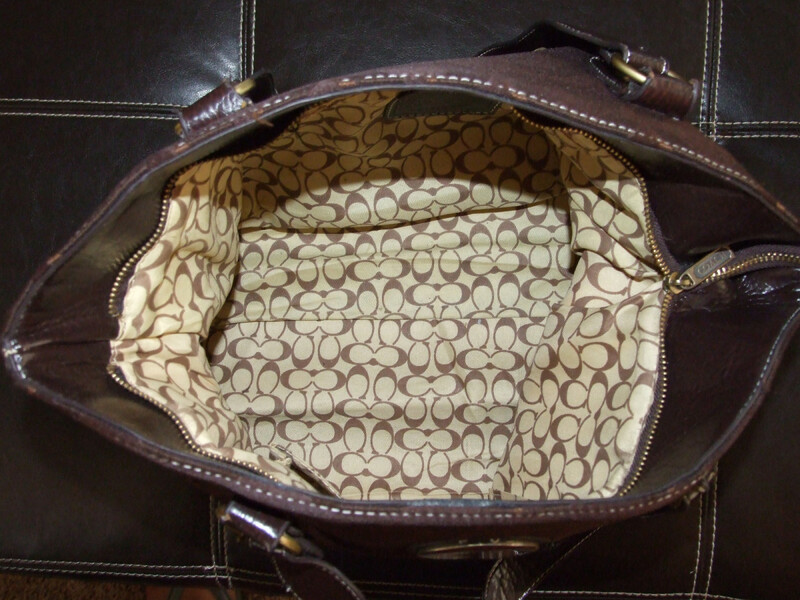 The easiest way to tell whether a Coach purse is fake or real is by the inside lining of the purse. For real purses, it will be a solid-color satin material. There are exceptions to this rule in the Legacy line of purses or the tooth hound lining in certain bags, but since this is a basic guide I am not touching on that. 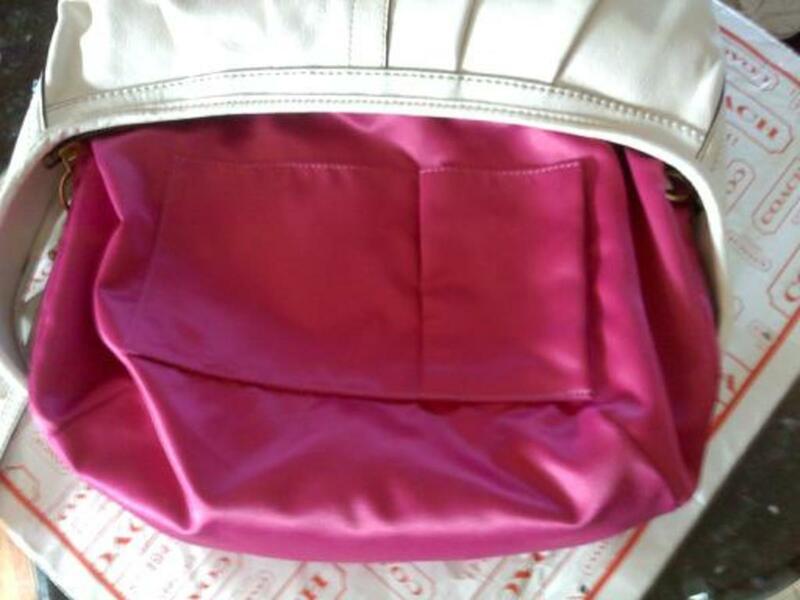 Fake Coach purses may be lined with solid-colored silk (very rarely, only high-quality knock-offs will have this and even then the material will be noticeable different in quality), or much more often with the "signature C" lining shown in the picture below. Authentic Coach sales tags are always white. They will list the MSRP price of the purse and the style number that I discussed above under Foolproof Tip 1 (Coach creed), as well as an abbreviated description of the style of purse. For example "Med Mad Met Hip" is Medium Madison Metallic Hippie. Fake sales tags are always red or brown with a white outside border, and these fake tags will be attached to the fake metal hangtag rather than to the hardware or to the inside of the Coach purse. By the way, Coach bags do not come with Coach booklets, only a small business-card-like Coach care card. REAL Coach signature C material. The C's can be split right down the middle of the purse. This tip obviously will not work on leather Coach purses; for them you need to use the earlier tips. But when it comes to Coach purses made from the "signature C" jacquard material, it's pretty easy to tell whether they are fake or real. 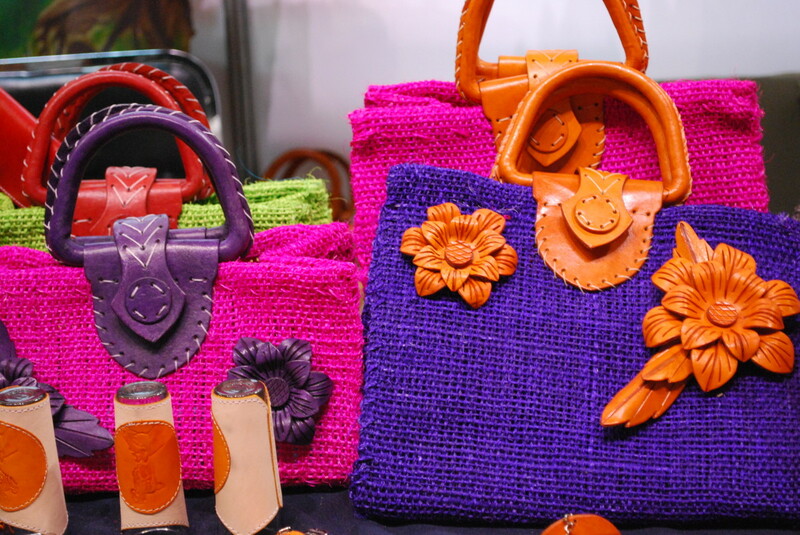 The C's in the material will always line up straight down the center of the purse, so if you were to cut the purse in half from top to bottom, through the middle of the bag, each side would have its own C. This pattern will continue throughout the purse and along the bottom of the bag. On fake Coach purses, the C's are usually not lined up and they are often off-center from the middle of the bag. Also, if they are genuine, these bags with the "signature C" material on the outside have solid inner satin linings. If the inside liner has the "signature C" design, the purse is not genuine. Feel free to contact me via Hubpages with any question, or with pictures, should you be thinking about purchasing a Coach bag from Ebay but are still unsure. I would be more than happy to help you verify its authenticity. Hello! I am looking at purchasing a coach bag from poshmark and the serial number from the inside matches with a Hamptons signature medium madeline tote bag from 2008, via coach customer service. I'm still wondering if it is a fake though. Any help would be greatly appreciated! The metal hangtag thing isn't foolproof, because the Coach company supplies replacement metallic tags for free. I have a navy Janice's Legacy bag that lost its original tag and I recently decided to look for a replacement. I saw a rather ratty looking navy leather tag for sale online for over $20 (no thx!) So I opted for the freebie option. I emailed Coach my bag's creed number, hardware color & mailing address. They got back to me in less than 24 hours and immediately generated an order for a free tag. They supply them in 3 tones: light gold, silver, and gunmetal. I went with gold to complement my bag's brass hardware. It may not be the original vintage tag my bag was issued with but at least I know it is authentic. Anyone opting for a metal tag do not waste your money with eBay etc. Just call or email coach! Hi there just purchased a beautiful grey coach handbag. The model is a 1942, No-E1832-31698. The lining is silk with coach written in it. Just checking to make sure its real. I bought a nice "Coach"? 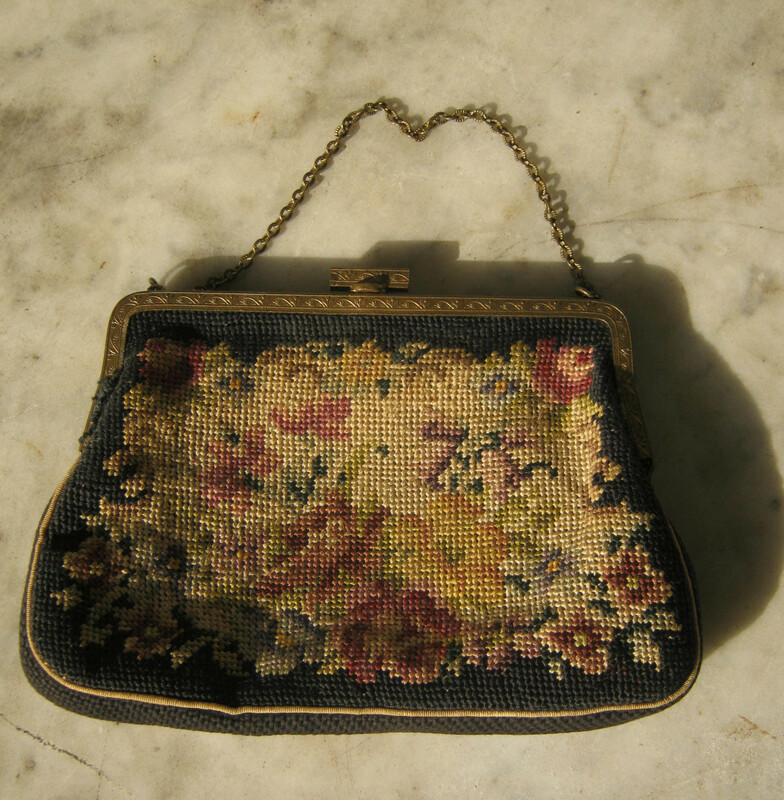 purse on Tophatter for $50.00. The serial number is F0873-13516. It has a nice plain thick silk lining. Does this mean it is a factory outlet piece; is this a good price? I think this is great and informative but also hilarious as coach has watered down the value of its bags. They can be bought on sale for a song and dance. I'd care if a Louis Vuitton or something $2000 was real or fake. But for $100 I just dont give a crap. If there is an F in front of the 5 numbers it's still a genuine bag! However this F indicates that it's a factory outlet piece. They're still made by coach, but they're often cheaper versions of the real thing. Don't be tricked into paying the full tag price on a bag with an F. Most outlet bags sell about 60% cheaper than the price listed on the tag! I have coach bag given to me & do not care if it is real of not, but would love to find more of this size & with all the pockets. how do I find all this out. Thanks for information how your information regarding serial numbers on the creed is no longer accurate. Coach stopped putting serial numbers on the patch over a year ago. Unfortunately newer bags do not have this information- dumb move on Coachs part IMO. I see Coach at Goodwill all. The time but the body will look good but handles are always messed up. hi! I enjoyed your article but did need to disagree with one point. I know for a fact some bags- pre -1990 did in fact come with C signature logo fabric. I own a couple that have been authenticated. You may want to change that piece of this article to help others in their authentication process:) thank you. 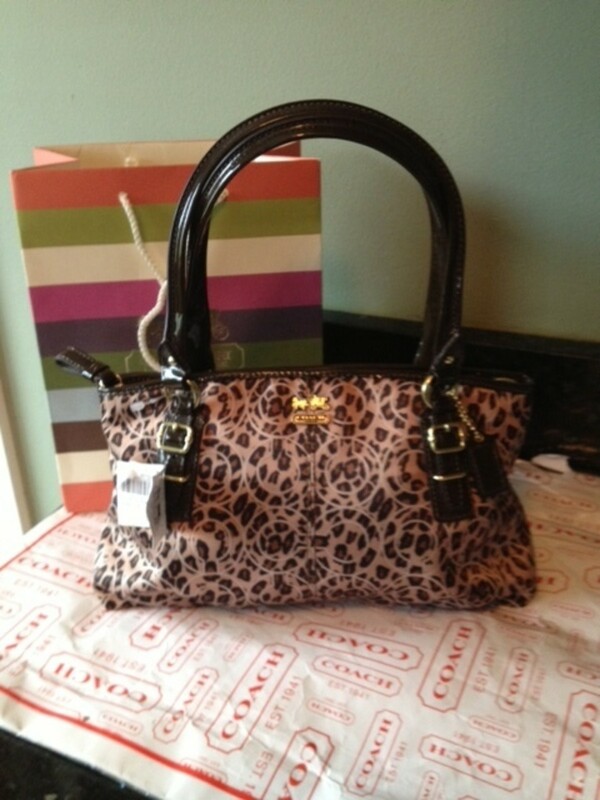 HI Alexa, Yes, its a Coach Signature Reversable tote with included travel pouch which would include the creed number. Id say its Authentic but without pictures I cant be 100% certain. Thanks! I bought a few coach “vintage” bags and now questioning if they are real. If i send you the creed # can you help? Looking for serial no: LO969-13821 would like to buy at a reasonable price. Thank you. Can you tell me if J0820-f13075 is real and what is it worth? How do I clean the suede on it? Hi, i was given this coach purse years ago from my grandmother who has since past on.....im just wondering if its real or fake, since i cannot ask her. Inside is the serial numbers N°F04J-6824....i think its fake but my friend thinks it may b real...thank u for your time. I would like your opinion about this coach purse please. How will i know if its an authentic coach bag? 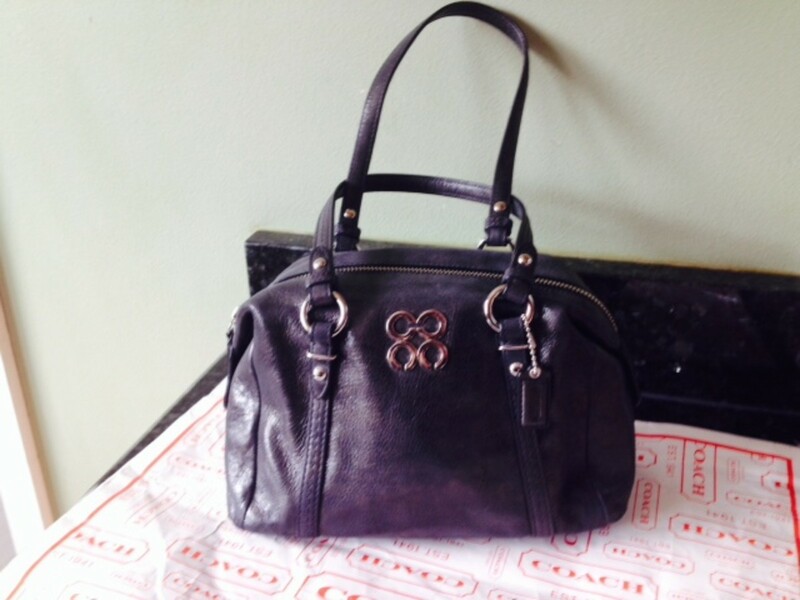 I have acquired a large Coach bag with creed patch and serial number that reads:#G1082-16742. Seems like a few rules are broken here? Any suggestions? I'm getting ready to purchase one today from a seller not sure if it's a real Coach or not! 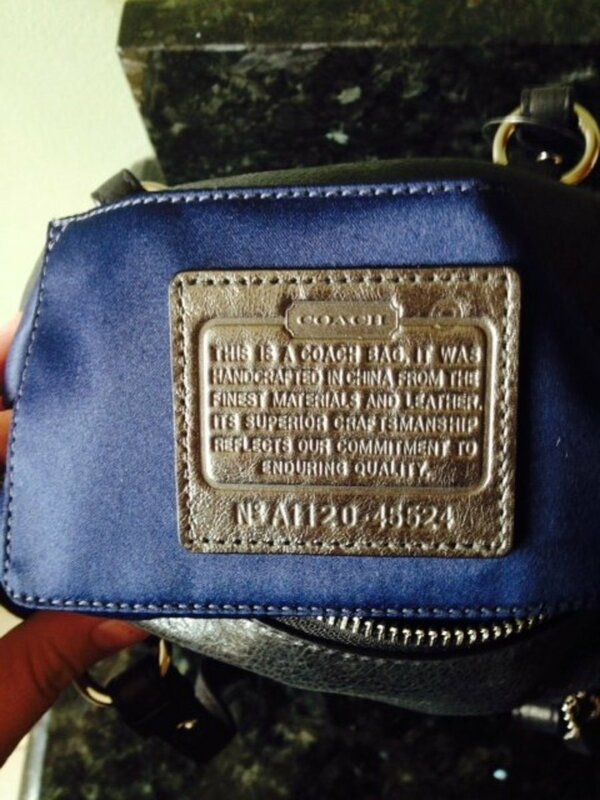 My purse has H1049-F15480 is my gift a real coach..
Hi I hope you can help me I just purchased a Coach Heritage signature flight back, I would like to know if its authentic can you help me with this? Hi. Got a Coach purse. Can't tell if it's real? Have won the second bag and now really questioning whether it is real. Could you let me know what you think before Thursday when I have to pay for it. She seems to have a lot of luxury items for sale. This one didn't have a serial number on the bag and I couldn't read the tag in the picture. I would send links and pictures but don't know how to do it. Would really appreciate the help asap. Thanks. Are bags sold at a Couch Outlet real? No A7B-9790. It was hand crafted in the United States. Are the Cereal numbers real? Thanks I bought a message bag unsure if it's real. is a Coach purse with No. co4u-1202 authentic or fake? Your number 4 is not completely true. Authentic Coach bags sometimes come with Coach booklets! My daughter worked for Coach and gave me several bags, some had a booklet inside! Where/how can I find one Made in USA? It appears that your rules don't apply to saddlebags. Coach.com shows them with leather lining or no lining, only the natural suede back of the leather. Also the serial numbers are SD-XXXXX(numbers). I have a bag from the 1980's from ebay. I think it may be real because I've been using it continuously for 15 years the damn thing won't die! I received a gift from a family member last year. A blue Coach tote. According to your article it seems authentic, however, the logo on the front is a silver oval similar to the turnlock style. It also does not have the serial number under the creed which I understand is not always used. There is no tag inside the bag with a serial number, just a clear tag that says MADE IN VIET NAM* VIETNAM. I bought 3 Coach Dakotah rivets bags on eBay. They all have a perfume smell . They were labeled new with tags. Do genuine Coach bags smell like perfume? I am male and no nothing about handbags but the coach bag I have seems to basically all match up to what is authentic but the model I have is F21883 made in China and on the zip mechanism it doesn't say ykk it says ideal so does this mean it fake? I could you tell me is this one is real or fake. I have a bag I was wondering if you could tell me if it's authentic or not!? ...same goes with bags for men? Come on girls!!! This post is olddddd. Somebody notifies the writer to change or update plz? As of today, 30 October 2016, I know for a fact that most of Coach bags don't have ID numbers anymore. I checked in person at department stores like Macys, Lord and Taylor, Nordstrom... and also Coach outlet stores in Illinois. Please DO NOT rely on a VERY OLD POST to verify your bag. Go to a store instead!! Where do you go an look up the serial number? Hello I purchased a Coach bag A2J-7801 and think its a fake. Any help? I could not find where to send a pic. I would like to know if this bag is authentic. Attached is the link and pictures. I have not bought it yet. Waiting for yiur advice. Thanks! I cant attach the link, so I am putting in the description. Coach Carrie Crossbody in pebble red authentic leather F36666, sold on Amazon.com by Electro Deals NH and fulfilled by Amazon. Thanks for the article. I actually just bought a Coach from Ebay and I was wondering if I could send you some pics to help with authentication? Does Coach make any purses with a print other than the Cs? Do they make an animal print bag? Thank you. Hey @Jasmin , there are coach factories in Vietnam, China & Phillipines. So it should be authentic. Thanks for sharing the information as I was not aware that we can get fake coach purse also. Hi, i bought coach purse in mainland and im suspecting it is fake. The serial number is F28502 and its made in philippines. Is it automatic fake if it's made in the philippines? Not all hangtag are leather the poppy collection has a hard plastic hangtag. I have one of the poppy bags and a magnet will not stick to the metal on it. Is it fake? I am interested in a COACH cardholder. Not sure if it is real. Hi i'm eyeing a coach bag online can i email it to you to authenticate? Pls. I need your email pls. I have a sinking suspicion that I bought a fake Coach. The serial number is CO6Q-11495 . According to your blog, this number many not even be in the correct format? It also is lined with the C pattern. The bag is Red with a embroidered design that includes the stage coach, a skull and pink flowers. Do you have an opinion on this? Is there any way I could email you some pictures of a Coach bag I just got for a gift? I haven't a clue whether it's real or fake. I've never seen one in this color... that you. Hi I need help authenticating a coach gabby tartan bag. Creed is H1040-F1548. This bag is a pink and black plaid. Should an authentic Coach match the c pattern in the back also? Is this a real bag? I can send pictures also. All of these bags have the correct Creed with the serial number on it and they also all have an attached leather hang tag in the same color as the bag. Hello. Can you help me determine if my bag is an authentic Coach? I can provide pics if needed. Thanks. Since there are many determining factors to verify that your bag is a COACH product, we are unable to make that determination with the registration number only. You can go online to Coach.com and get the phone number. Give them the serial number, and a sales rep can verify if it is authentic. Just wondering if this is an authentic Coach bag number L1048-F16443? I'm wondering if a Coach backpack purse that I bought at a Goodwill store is real or a fake, can you help me? I just purchased a leather COACH on Ebay for the first time ever and it's gorgoeus and in same style as the bags I have purchased in NYC. I am curouis if it is real because the Creed has states Made in Italy, L7E-4181, yet the exterior has a stamp that says Coach New York. However, the bag has a mildewly smell to it. Is there a way to get rid of it? I love the bag, but my gut says return it. 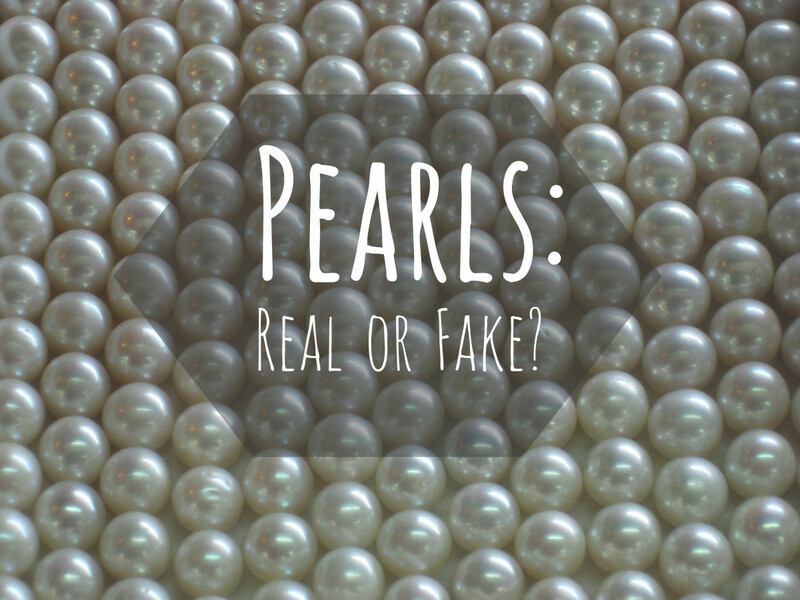 How can I send you a picture to tell if mine is real? http://www.ebay.com/itm/COACH-Large-Brittish-Tan-L... what do you think? Hi I don't know if you're still taking questions/comments, I'm pretty sure all my Coach bags are fake anyway (after having, briefly, a real LV & a real Gucci it gets easier to spot low quality anything; I always look at the leather handles, if they're nice and soft and supple, that's an indicator of quality: I have had amazingly nice/expensive knock-offs perfect in every detail but with stiff cheap feeling handles). I just wanted to mention that I'd been perusing the Coach website recently trying to verify if two pairs of glasses I had were authentic, and I read THEIR authentication tips. Simply buy at a Coach store or one of the authorized retailers they have listed (you'd have to double check but I think coach outlet.com was listed as NOT having to do with them, I don't remember). They also said that they DO NOT VERIFY items by serial number via phone, or authenticate items in stores. 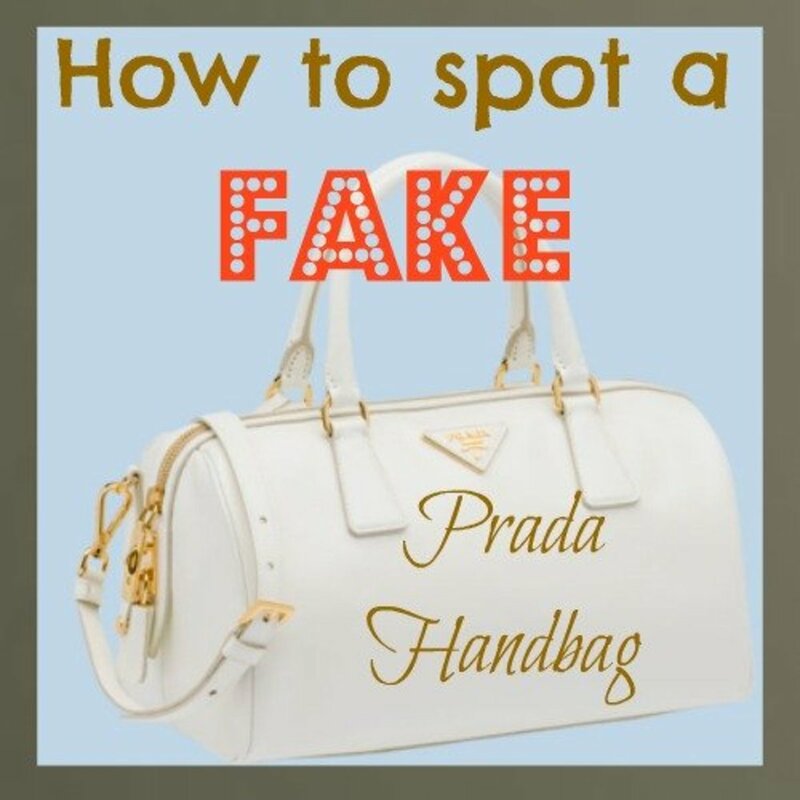 Their theory is that if you shop where you should you won't need to worry about buying a fake. I do understand that they need to combat black market knock-offs, and so discourage online aftermarket sales which are totally outside of their control. They can't rightly verify by serial # alone, as you have mentioned, and they can't have their upscale retail stores overrun with people lined up with- mostly- fake bags for their salespeople to inspect. But they are denying economic & consumer reality. Most people can't afford to walk into a Coach store and shell out $300, $600, $1,000+ on a luxury accessory. So many people turn to places like eBay to realize what had been out of reach. They are 1st time owners and so don't often realize what the genuine article looks & feels like. They also don't realize that "amazing deal" they got is utterly unrealistic. Why would someone sell for $25 what they could get $100+ for? There certainly are RARE exceptions. But it's like the people on eBay who leave negative feedback about the "cheap quality" whatever they just bought...for $1. One of the ladies previously asked your opinion on a purse she was considering from a garage sale site. Then said she had been ripped off already buying from a garage sale site was tired of it. With $175 I believe you could actually go into a Coach store and find something, sidestepping the whole question of authenticity. But I f you are hell bent on getting a "deal", well you get what you pay for. Sorry for how long this got; I just really wanted your input on Coach's official stance on refusing to authenticate items.